Reports in BRIAN are generated as web pages. To print the reports, generate the web page and then use a web browser such as Firefox, Internet Explorer or Safari for printing. The basic discography information organized by session in date order for a selected performer. List of issues along with the contained performances for a selected performer. List of performed songs in the discography for a selected performer along with composers and dates performed. Index of all performers in the discography for a selected performer along with the dates they appear and instruments they play. Index of composers of all songs performed in the discography for a selected performer or label along with dates performed. Same as Sessions report, but for a label instead of a selected performer. Same as Songs by Title report, but for a label instead of a selected performer. Same as Personnel Index report, but for a label instead of a selected performer. Same as Sessions report, but for all sessions in Database regardless of performer. Same as Issues report, but for all issues in Database regardless of performer. A Sessions report that only reports on sessions currently set as "flagged" using the Flagged checkbox on the Sessions window. The Reports Generator window will display template information for HTML formatted reports that can be viewed using a web browser. Using the Reports Generator, a report can be selected and generated. Templates can be added, changed, and deleted using this window. A listbox at the bottom of the window is used to select a report. It is important to note, a template must be added or edited and saved before it can be used to generate a report. It is not possible to change fields in a the report window and see those changes reflected in a report without first saving the changes to the template. Start Date/End Date In these fields, enter the range of dates to be reported. Report Type Use this menu to select one of the 11 report types, as listed above, that BRIAN can generate. Template Filter Use the Template Filter to display only templates that match the contents of the Label/Artist column with the string of chars entered in the filter. This is very useful for discographers that have more templates than will fit in the list without scrolling. Add Template Use this button to initiate the process of adding a template. Pressing Add Template will put the window the window in edit mode and clear all the fields to default settings. The Edit Template button is converted to a Save New Template button and the Delete button is converted to a Cancel New Template button. Enter the data for a new template and press the Save New Template button to save the changes. If the fields, menu selections, and checkboxes validate, the template will be saved and added to the list below. Press the Cancel New Template button to discard any changes and revert back to viewing the previously viewed template. Edit Template Use this button to initiate the process of modifying an existing template. Pressing Edit Template will put the window into edit mode but retain all the fields from whatever template was in view when the button is pressed. The Edit Template button is converted to a Save Changes button and the Delete button is converted to a Cancel Changes button. Make the changes to the template and press the Save Changes button to save. If the fields, menu selections, and checkboxes validate, the template will be saved and added to the list below. Press the Cancel Changes button to discard any changes and revert back to viewing the template in its state before the Edit Template button was pressed. Pro Tip… You can copy an existing template to use as a basis for a new template. Press the Edit Template button and make your changes to the existing template. But instead of simply pressing the Save Changes button, hold down the Opt (for the Mac) or Alt (for Windows) key. You will see the label on the Save Changes button change to Save Changes As… which means that pressing the button will save a copy of the existing template. Delete Template Pressing this button will permanently delete the selected template from the database. Generate Report Pressing this button will generate reports for all selected templates in the template list. BRIAN will use the folder selected in the Preferences window to store the reports. If you would like to select a different folder, hold down the Control key while pressing the Generate Report button and BRIAN will prompt you again for a folder. This new selection will automatically update the selection in the Preferences window for all subsequent report generations. Override php Clicking this checkbox will force any php reports to be generated as html reports. This is handy for proofing php markup reports without having to upload them to the server. After the proofing, just uncheck the box and regenerate the reports to be uploaded. Show Reports If this box is checked, the reports will automatically open in a local browser window after they are generated. Of course, if you are generating php reports, they will not render unless you are running your computer with php active. Set Personnel Press this button to open a popup window for adding personnel names to the list of artists to be included in the report. Reporting will include sessions that include ALL listed artists, not any session including at least one of the artists. Session Label This is a lookup field. If a label is entered in this field, only sessions for this label will be reported. This label field corresponds to the label entered on the Sessions window, NOT the Issues window. See the section on Report Filtering for a more descriptive explanation of this feature. Page Title This field is used to enter the title that will appear in the title bar of a web page browser window. It will be used to fill in the TITLE HTML tag. Header This field is used to enter the header that will appear at the top of the report. It will be used to fill in the H1 HTML tag at the top of the page. HTML File This field is used to enter the file name of the generated web page. HTML Return File The web page can include a link back to any page, generally the one that links to it. This field is used to enter the file name of the web page that will be returned to. HTML Return Text This field will store the text used for the return link. Report Descript. This field holds a description of the report that can be used to identify it in the list box below. Author Name This field will be inserted just under the Header field of the report. Author Email If entered, this field will be used to generate a mailto hyperlink with the Author Name field. Metadata File This field will hold a metadata file name. The file name will be inserted into a string of php code for expansion on php type web pages. This is generally used to insert Dublin Core Data into web pages. Iss. Rel. Date Check this box to include the issue release date for any issues reported. Auth. Issues Check this box to display any authorized issues for any performance included in the report. An issue defaults to being authorized if it was not specified as being a bootleg when entered on the Issues window. Session Label Check this box to display the Session Label, if entered, for any session included in the report. Composers Check this box to include composer information for any performances included in the report. Session Title Check this box to display the Session Title, if entered, for any session included in the report. Arrangers On the Session Report, arrangers can be included in the personnel listing or after each specific performance which they are associated. Check the Arrangers checkbox to choose having the arrangers listed with the performance. If arrangers are listed with the performance, then they are not included in the personnel exceptions. Leave the arrangers checkbox unchecked to have arrangers listed in the personnel listing and the personnel exceptions. For the Personnel Index, check the arranger box to have arrangers included as personnel. Uncheck the box to exclude arrangers in the index. On Hand Check this box to include any matrix numbers entered for performances included in the report. Matrix Check this box to include any matrix numbers entered for performances included in the report. Bootlegs Check this box to display bootleg recordings for any performance included in the report. Unissued Check this box to have the word Unissued listed under any performance that does not have an issue associated with it. Ordinarily, it is assumed that a performance is unissued if there are not issues listed with it, but this feature allows the discographer to be explicit rather than implicit. Pers. Excpts. Check this box to allow BRIAN to automatically generate a list of personnel exceptions for the reported session. Common Iss. This set of radio buttons controls when an issue is reported as containing all performances of the session, or in other words, be reported under the "All Titles" heading. If All Perfs. is selected, then ALL performances must be contained on ALL issues that contain performances for the session. If any performance is NOT contained on any one of the issues associated with the session, then none of the issues will be reported under the "All Titles" header. If Any Perf. is selected, then any issue that contains all performances for the the session will be listed under the "All Titles" header. Click the links below to see examples of each choice. • Format - the order of the format labels as set in the format popup with secondary sort by issue date for duplicate formats. • Rel. Date - release date as entered for the issue with the secondary sort of format for duplicate release dates. Issues with no release date specified will be considered as earlier than issues with a release date. Session Type/Format list selection Depending on the type of report template being created, a selection list for session type or format will be displayed. Session based reports will get the session type selector and issue based reports will get the format selector. In each case, there is the option to restrict the report to including on items that match the checked selection. There is also a checkbox to select all, rather than individually checking each type when creating or modifying a template. 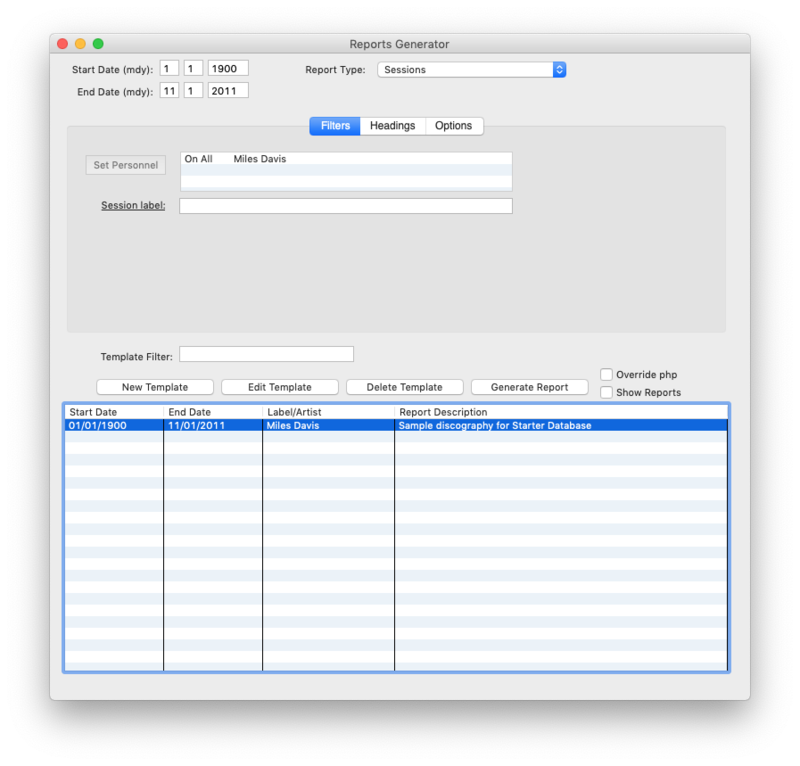 To add a template to the database press the Add Template button to put the window into edit mode. The Edit Template button is converted to a Save New Template button and the Delete button is converted to a Cancel New Template button. To edit information for a template already entered in the database, click on the template entry in the list box to force all the data for the template to display in the entry fields. Press the Edit Template button to put the window in edit mode. Proceed to make any desired changes to the template. Then press the Save Changes button to save the changes to the database. Pressing the Opt key (on the Mac) or the Alt key (on Windows) will change the Save Changes window to be relabeled at Save Changes As… and cause the edited changes to be saved as a new template. This is very handy if you just want to create a template similar to one you already created. To delete a template from the database, click on the template entry in the listbox to be deleted and then click on the DELETE button. A prompt will appear to verify that the delete is correct. Press the DELETE button to confirm the delete and the CANCEL button to cancel the delete.